Order custom carbonless forms for effortless business transactions and to make a big first impression. Carbonless forms help you process and track countless transactions. These also carry your brand, whether in store or out in the field. Our carbonless form printing services help you do this and more. 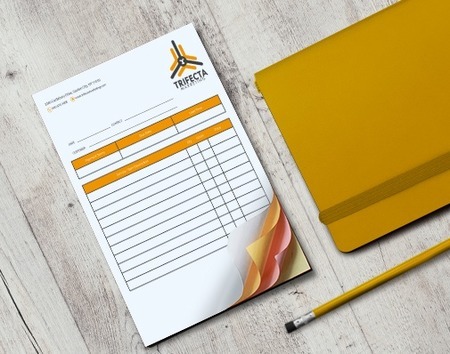 From purchase orders for manufacturing to contracts made in the hotel or marketing industries, you can create custom carbonless forms that stand out. Our carbonless or NCR (no carbon required) forms do away with carbon copy paper. Ink is embedded in each sheet, allowing the imprint to be copied onto the form underneath. Writing or typing on the first sheet is easier thanks to the use of smooth, lightweight 20 lb. paper. Our paper is also recyclable, adding to its advantage over traditional carbon copy printing. 2-Part Set (white/yellow) provides a duplicate copy on yellow paper. 3-Part Set (white/yellow/pink) gives you a triplicate or three copies of one form. 4-Part Set (white/yellow/pink/gold) gives a “quadruplicate” or four copies of one form. Note: Each set comes with the forms or copies glued together. Present customized forms that lead with your company logo and name. Our extra features also strengthen your carbonless forms’ impact on customers. “Padded with cardboard back” binds all your carbonless form sets to a chipboard. You can flip between sets and prevent the forms from folding during transit. “Padded with wrap-around cover” has two functions. It acts as a front white cardstock cover and as a separator between sets for writing. Having forms sequentially numbered maintains order from the very beginning. You avoid inputting the wrong information and have a reference for documentation. You’ll need many copies of lengthier documents such as contracts. You can print on one or both sides and in black or full color. Get in touch with our print experts to find out more about our carbonless form printing options. If you have a ready file, feel free to upload it or start creating a new one using our available templates. Select our PDF proof option after uploading to avoid any errors before printing. Good to know: We do not accept scanned files. Make sure to upload a high-resolution file. This ensures that when we print carbonless forms, every detail comes out clear and easy to read. Are all loose forms glued together? The sheets in each set are glued together according to your chosen location. Note that this is different from padding, which combines multiple sets in one pad. What is the advantage of carbonless form printing over carbon paper? Carbonless forms do away with placing carbon paper between two or four sheets. The pressure applied on the top form allows the imprint to transfer onto the succeeding sheets. Is the 20 lb. paper laser compatible? No. A laser printer does not apply pressure during printing. Whatever is printed on the top sheet won’t copy on to the forms underneath. The laser printer can also damage the no carbon layer that allows the transfer. You only need to wait 3 business days for your order to be ready. The printing turnaround is the number of days to produce the carbonless copy paper. Shipping time to your indicated address starts after the printing turnaround. Our carbonless forms layout templates will help you properly create your design. They show you the exact size your artwork should be to print with a professional look. They can be downloaded through a desktop PC in AI, PUB, PSD, PDF, or JPG formats combined into one .ZIP file. Even a high-quality, professional-looking receipt can make an impact on your customers. Keep these tips in mind as you create and disseminate your custom carbonless forms. Be daring with your design. Don’t add to the monotony associated with completing business forms. Incorporate colorful design elements and contemporary fonts into the design. These keep customers interested as they fill out the forms. Keep yourself accountable. On site industries such as transport and utilities use carbonless forms. Provide your staff with padded sheets that are easy to carry around and write on. Complement your digital data. While most transactions are done online, mishaps can happen. Files can get erased, systems crash. Avoid starting from zero and have a ready paper trail.